The Exaltation of the Holy Cross is one of the most ancient and revered observances in the whole Church, both East and West. In 325 A.D., after the persecutions against the Christians had just ended, Christians were free to express their religious feelings and to adorn their places of worship with symbols of the faith, such as the cross. The Empress – Saint Helen, a devout Christian and mother of the Emperor Constantine the Great, went to Jerusalem to undertake a mission to retrieve the cross upon which Christ had been crucified. After a long and futile search, the Empress was attracted by the unique scent of a plant called VASILIKOS (basil) in the area where Jesus had been put to death. She ordered excavation, and three crosses were unearthed. A paralyzed person was positioned on each of the crosses to determine the cross upon which Christ had died. When the person was placed on the true cross, he recovered miraculously and walked. On September 14, the event was celebrated. The Archbishop and Patriarch of Jerusalem – Saint Makarios, who had also witnessed the miracle at the historic site, raised the cross and blessed the people with it as they all responded. “Lord, have mercy” ( “KYRIE, ELEISON”). On the Feast of the Exaltation of the Cross (or Triumph of the Cross) we honor the Holy Cross by which Christ redeemed the world. The public veneration of the Cross of Christ originated in the fourth century, according to early accounts. The miraculous discovery of the cross on September 14, 326, by Saint Helen, mother of Constantine, while she was on a pilgrimage to Jerusalem, is the origin of the tradition of celebrating the Feast of the Exaltation of the Cross on this date. Constantine later built the Church of the Holy Sepulchre on the site of her discovery of the cross. On this same pilgrimage she ordered two other churches built: one in Bethlehem near the Grotto of the Nativity, the other on the Mount of the Ascension, near Jerusalem. In the Western Church the feast came into prominence in the seventh century — after 629, when the Byzantine emperor Heraclius restored the Holy Cross to Jerusalem, after defeating the Persians who had stolen it. Christians “exalt” (raise on high) the Cross of Christ as the instrument of our salvation. Adoration of the Cross is, thus, adoration of Jesus Christ, the God Man, who suffered and died on this Roman instrument of torture for our redemption from sin and death. The cross represents the One Sacrifice by which Jesus, obedient even unto death, accomplished our salvation. The cross is a symbolic summary of the Passion, Crucifixion and Resurrection of Christ — all in one image. The Cross — because of what it represents — is the most potent and universal symbol of the Christian faith. It has inspired both liturgical and private devotions: for example, the Sign of the Cross, which is an invocation of the Holy Trinity; the “little” Sign of the Cross on head, lips, and heart at the reading of the Gospel; praying the Stations (or Way) of the Cross; and the Veneration of the Cross by the faithful on Good Friday by kissing the feet of the image of Our Savior crucified. 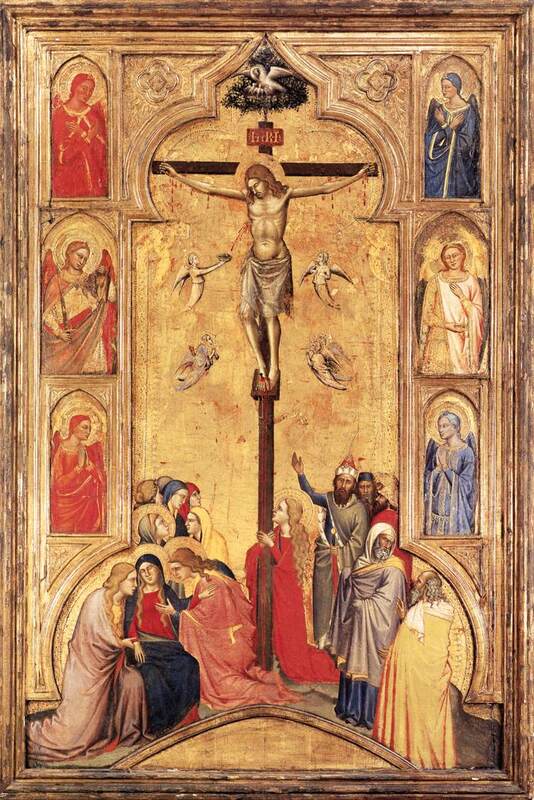 Placing a crucifix (the cross with an image of Christ’s body upon it) in churches and homes, in classrooms of Catholic schools and in other Catholic institutions, or wearing this image on our persons, is a constant reminder — and witness — of Christ’s ultimate triumph, His victory over sin and death through His suffering and dying on the Cross. We remember Our Lord’s words, “He who does not take up his cross and follow me is not worthy of me. He who finds his life will lose it, and he who loses his life for my sake shall find it” (Mt 10:38,39). Meditating on these words we unite ourselves — our souls and bodies — with His obedience and His sacrifice; and we rejoice in this inestimable gift through which we have the hope of salvation and the glory of everlasting life. The people became impatient on the way. And the people spoke against God and against Moses, “Why have you brought us up out of Egypt to die in the wilderness? For there is no food and no water, and we loathe this worthless food.” Then the LORD sent fiery serpents among the people, and they bit the people, so that many people of Israel died. And the people came to Moses, and said, “We have sinned, for we have spoken against the LORD and against you; pray to the LORD, that He take away the serpents from us.” So Moses prayed for the people. And the LORD said to Moses, “Make a fiery serpent, and set it on a pole; and every one who is bitten, when he sees it, shall live.” So Moses made a bronze serpent, and set it on a pole; and if a serpent bit any man, he would look at the bronze serpent and live. Though He was in the form of God, did not count equality with God a thing to be grasped, but emptied Himself, taking the form of a servant, being born in the likeness of men. And being found in human form He humbled Himself and became obedient unto death, even death on a cross. Therefore God has highly exalted Him and bestowed on Him the name which is above every name, that at the name of Jesus every knee should bow, in heaven and on earth and under the earth, and every tongue confess that Jesus Christ is Lord, to the glory of God the Father. He who believes in Him is not condemned; He who does not believe is condemned already, because He has not believed in the name of the only begotten Son of God. In [God ] we have redemption through His blood, the forgiveness of our trespasses, according to the riches of His grace, which He lavished upon us. For He has made known to us in all wisdom and insight the mystery of His will, according to His purpose, which He set forth in Christ as a plan for the fullness of time, to unite all things to Him, things in heaven and things on earth. Christ Jesus, who, though He was in the form of God, did not count equality with God a thing to be grasped, but emptied Himself, taking the form of a servant, being born in the likenes of men. And being found in human form He humbled Himself and became obedient unto death, even death on a cross. Therefore God has highly exalted Him and bestowed on Him the name that is above every name, that at the name of Jesus every knee should bow, in heaven and on earth and under the earth, and every tongue confess that Jesus Christ is Lord, to the glory of God the Father. You know that you were ransomed from the futile ways inherited from your fathers, not with perishable things such as silver or gold, but with the precious blood of Christ, like that of a lamb without blemish or spot. Through Him you have confidence in God, who raised Him from the dead and gave Him glory, so that your faith and hope are in God. “Consummatum est.” It is completed — it has come to a full end. The mystery of God’s love toward us is acomplished. The price is paid, and we are redeemed. The Eternal Father determined not to pardon us without a price, in order to show us especial favor. He condescended to make us valuable to Him. What we buy we put a value on. He might have saved us without a price — by the mere fiat of His will. But to show His love for us He took a price, which, if there was to be a price set upon us at all, if there was any ransom at all to be taken for the guilt of our sins, could be nothing short of the death of His Son in our nature. O my God and Father, Thou hast valued us so much as to pay the highest of all possible prices for our sinful souls — and shall we not love and choose Thee above all things as the one necessary and one only good? If possible attend Mass together. Consider taking your family to a church that has especially fine Stations of the Cross. Look at the images and explain their meaning. At each station pray, “We adore you, O Christ, and we bless you, for by your Holy Cross you have redeemed the world.” At the end, have the children kneel before the Blessed Sacrament and say a Hail Mary, an Our Father, and a Glory be. Make the evening meal today more festive than ordinary — light candles on the table or use the good dishes. Read one or more of the prayers or scripture readings for the day before the evening meal. Older children could take turns doing the readings. Explain to children the meaning of the Sign of the Cross that we make before meals, and point out how this action is intended to unite every one of us with Jesus’ sacrifice for us — His crucifixion and His resurrection from the dead. Make a point of mentioning how great is God’s love for us. Encourage children to memorize John 3:16. This is a key verse about the triumph of Jesus’ sacrifice on the Cross, and encourages children to revere and respect God’s word in the Bible. Give a small reward or privilege to each child who memorizes the verse. Have them recite it for you when they say their bedtime prayers. — Frost a sheet cake with white icing, make a large cross on the cake with red icing, and pipe “John 3:16” on the Cross. Let the children help decorate the cake further with silver dragees or colored sprinkles. If there are crucifixes in the children’s rooms, make sure to call attention to it at bedtime prayers. If not, today would be a very good time to get them. Dear Brothers and Sisters, we are invited to look upon the Cross. It is the “privileged place” where the love of God is revealed and shown to us.… On the Cross human misery and divine mercy meet. The adoration of this unlimited mercy is for man the only way to open himself to the mystery which the Cross reveals. “As Moses lifted up the serpent in the wilderness, so must the Son of man be lifted up, that whoever believes in Him may have eternal life” (John 3:14-15), says Jesus. What do we see then when we bring our eyes to bear on the cross where Jesus was nailed (cf. John 19:37)? We contemplate the sign of God’s infinite love for humanity. O Crux, ave spes unica! Saint Paul speaks of the same theme in the letter to the Ephesians…. Not only did Christ Jesus become man, in everything similar to human beings, but He took on the condition of a servant and humbled Himself even more by becoming obedient to the point of death, even death on a cross (cf. Philippians 2:6-8).